'That is what we should have done on Saturday,' was the verdict of Horsham manager Dominic Di Paola as they advanced past Corinthian in the FA Cup at the second time of asking on Tuesday. And this time it was a five-star display as Lee Harding, Joe Shelley, Rob O'Toole, Rob Smith and Jack Brivio were all on target in a 5-0 first qualifying round reply success at Culver Road. A late leveler from the Southern Counties East League Premier Division side on Saturday saw the first meeting finish 1-1 and left Di Paola frustrated that they didn't see the game out. 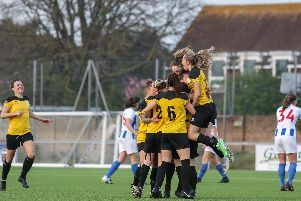 But just four days later and the Hornets boss was praising one of their best performances of the season as they set up a second qualifying round home tie with Heybridge Swifts and pocketed £6,000 in prize money. Di Paola said: "I thought we were on it and we played really well. To be honest, it is what we should have done Saturday. "Now we are further away from it, I can be a bit more honest and point to the surface up there which made it really poor, but I did not want to make excuses after the game. I think getting back on our pitch we were able to play some football. "They did move the ball around at times and did ok, they are no mugs and have only lost one game all season. They have got some quality players and their 'keeper made ten worldy saves over the two games. "We said at half-time they would have spell. It was a huge game and with £6,000 on it, their manager would be saying to have a go and get at us. We managed that really well, we got our second, tired them out which allowed us to express ourselves and play football. "I think it was our most joined up performance over 93 minutes. Every game we have been in and I think against Haywards Heath apart from the last 25 minutes which were a bit of a disaster, we played well. I think it was our best full 93 minutes of the season so far." Smith was twice thwarted early on, first by the crossbar and then by goalkeeper Aiden Prall, all before O'Toole headed over. Harding was denied then by a diving Prall, who tipped his header away. The goalkeeper then spared defender Jamie Billings' blushes as he stopped him putting through his own net. The home side did lead two minutes before half-time as Harding’s shot from the edge of the area and ricocheted off Jack Healey into the net. The Hornets doubled their lead on 55 minutes when Shelley headed home after a succession of corners. More chances was begging until O'Toole was set up Smith's flick on 73 minutes and he made it 3-0. Three minutes later, Smith turned home a Harding pass, before substitute and new addition Brivio nodding in from close range with his first touch to wrap up the victory. Horsham: Pelling, Metcalf (Taylor 78), Hyde, Shelley, McElligott, Hoare, Coleman, Harris (Brivio 76), Harding, O'Toole (Richardson-Brown 74), Smith. Unused: Hartley, Lovegrove, Hayward.